My every waking moment for the past week and a half has been spent either at Home Depot or my new apartment, drilling, painting, sewing and building. When I move into a new place I obsessively throw myself into interior projects until I feel at home/ temporarily satisfied. This apartment, much like my past spaces is being overhauled in true "poor girl" fashion. My budget is tighter than ever! Lots of inexpensive facelifts and later this week I'll be sharing my iphone photos of the process thus far! But for now...we talk fashion. Alas, this is a style blog. 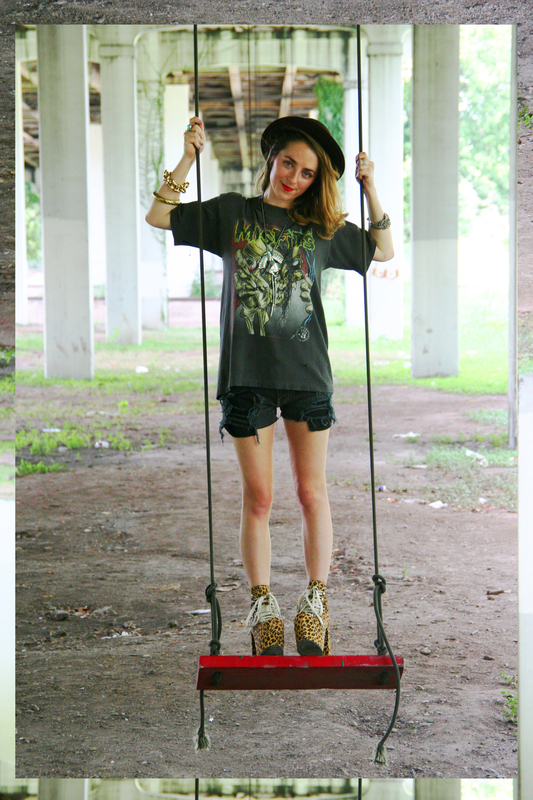 And what goes better with a grungy vintage rock tee than mysterious swings hanging under an old bridge? Alex discovered this sort of sketchy but very sweet spot under the Tillery St bridge during one of his east side adventures. However, the photos we took don't do this installation justice. Under this bridge hang dozens of swings, creating that feeling of falling into a mirror or a photo within a photo. One after the other, and they are all painted red. They have been anonymously installed part of the global Red Swing Project, which actually started here in Austin. The organization has hung and inspired over 200 red swings in the USA, India, Thailand, Brazil, Taiwan, South Korea, France, Spain, Portugal, Haiti, Poland, Italy, Germany and Australia. The whole idea being, to promote playfulness around the world. Don't you like that? I like it. If you're in Austin, go check them out! Wearing: Hat from Wasteland. Misfits Tee from Feathers! Shorts from a fleamarket in LA. Shoes: Unif hellbounds. Necklace: Uncommon Objects!